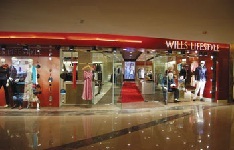 NEW DELHI: Diversified business group ITC's apparel retail chain Wills Lifestyle plans to open 60 stores in existing and new markets, including smaller cities, in the next three years to expand its retail footprint in India. "The plans are underway to expand the retail footprint with the addition of 20 stores each year for the next 3 years," ITC's Lifestyle Retailing Division Chief Executive Atul Chand told PTI. Elaborating on the expansion plans, he said: "This (expansion) will encompass high-streets locations and malls, in existing cities and penetrating the tier 2 markets which are displaying high potential for premium fashion." Wills Lifestyle currently has 92 Stores across 40 cities, spread across premium high-streets, malls as well as 5 boutiques at luxury ITC Hotels. It is also available in 700 premium department stores (Shoppers Stop, Lifestyle and Central) and leading apparel outlets. The company has partnered with Franchise India to open new stores. Talking about partnership with Franchise India, Chand said: "The association with Franchise India is a step in that direction to partner in the exploration of new potential markets, as well as, identification of new micro-markets in the cities where we are already present." Earlier this year, Wills Lifestyle had said it was targeting 20 per cent increase in the turnover in the current fiscal and and plans to add 15 stores in non-metros in the next 18 months. Formal and casual wear brands, along with a separate women's range, online retailing and new stores in tier 2 and tier 3 towns would be the growth driver for Wills Lifestyle, it had said.